note: Clicking on any of the images here will give you a larger image so you can see the details more clearly. While I have always had a love for all things indigo, this was the first piece at the Arts of Pacific Asia Show in San Francisco this month that inspired me to reach for my camera. I discovered it in the booth of B.C. Dentan, Works of Art. This formal samurai garment dates from the mid- to late Edo era (1750-1800) . It is unlined and has three mon, or family crests, embroidered in gold thread on the high standing collar. 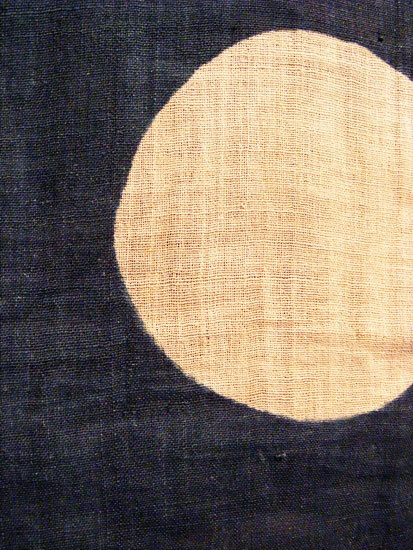 It is woven of bast fiber (likely linen or hemp) and while soft to the touch, it has the slight crispness common in such textiles. The front does not overlap as a kimono would, and as such would most likely be worn over other garments. 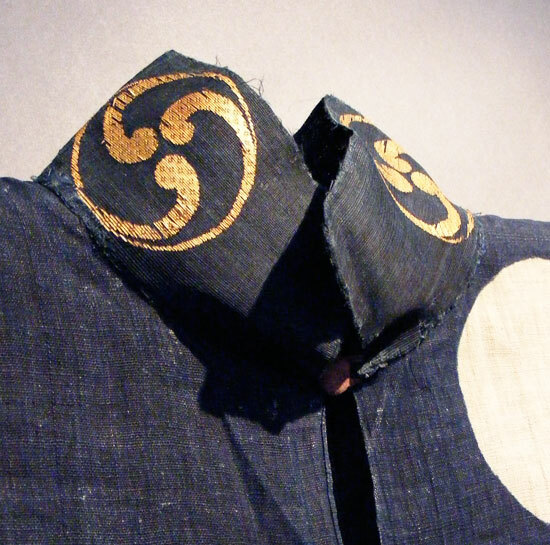 Considering how traditional Japanese formal wear is composed of multiple layers, it probably would have been under at one or more other garments, including a kataginu, as well. In this way the ornate collar and bright white circles would have been highly visible. 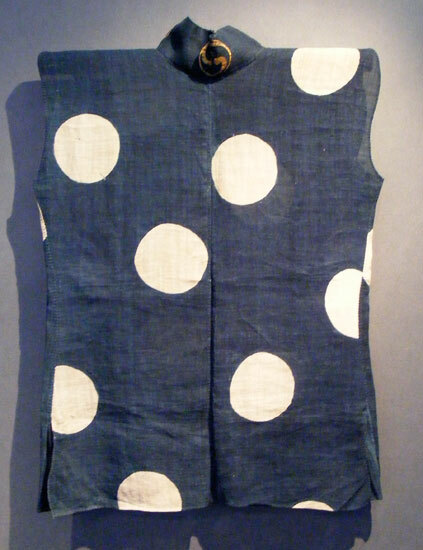 Given the cut of the arm hole, it would appear that it was not worn over kimono. I surmise that it was worn over one or more layers of undergarments that had narrow sleeves, the sort that would have been worn under armor. The comma- shaped crest is called mitsu tomoe, of which this style is recognized as the Hidari Gomon, the traditional symbol of Okinawa. As the vest is unlined and woven of a more gauzy material, it would have been used for summer wear. Considering the relatively temperate climate of Okinawa in relation to the rest of Japan, the lighter weight of this garment may have been extremely practical. This piece, while it does appear to have been worn, is in excellent condition for its age. The embroidery exhibits some fraying and there are small snags and holes in areas of greater wear, but overall it has been well preserved. The playfulness of the bold dots belies the seriousness with which it would have been worn. However, in a room filled with other samurai dressed in their finest, it certainly would have stood out. I have been digging around trying to find more information on vests such as this, but to be realistic, historical garments don’t always fit a specific mold, much as we’d like them to. 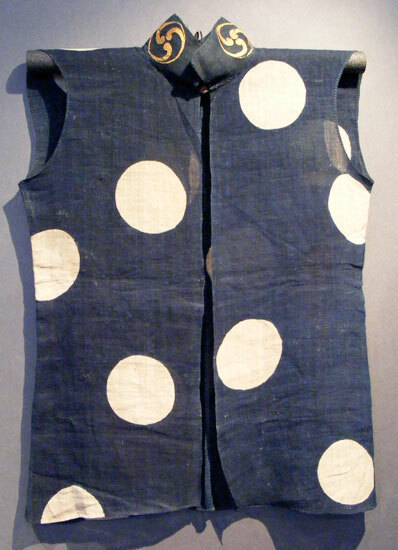 While there are books and websites that list samurai garments as they are used by historical reinactors (Society for Creative Anachronism (SCA) sites are often a good resource), I have yet to find anything that resembles this vest exactly. Many tie in front, have no collar or overlap across the chest. 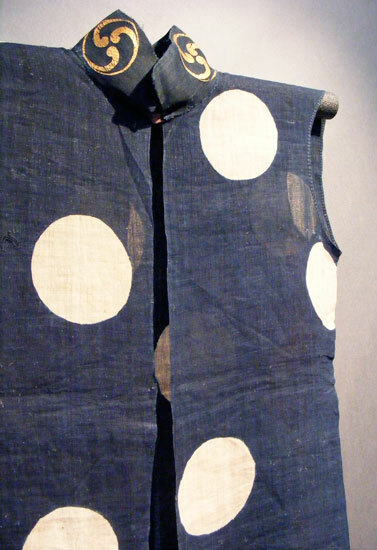 Here a close-up of the garment shows how the large dots clearly stand out from the indigo dye. I assume either the indigo was brushed in while the fabric was still on the bolt, or that the circles were reserved with a rice paste resist while the bolt was dip dyed in a vat of indigo. By the end of the Tokugawa era, samurai were aristocratic bureaucrats for the daimyo, with their daisho, the paired long and short swords of the samurai (cf. katana and wakizashi) becoming more of a symbolic emblem of power rather than a weapon used in daily life. 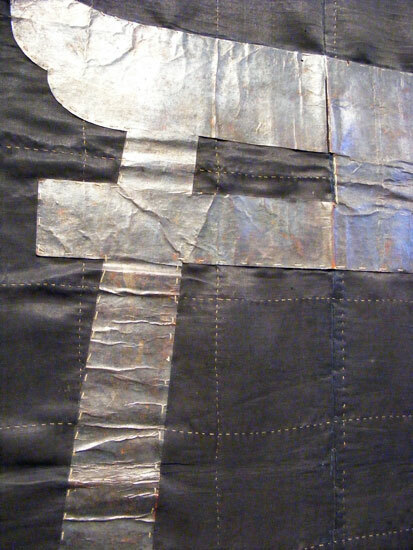 To follow the samurai theme, here are some images of a samurai flag that would have graced the battlefield. 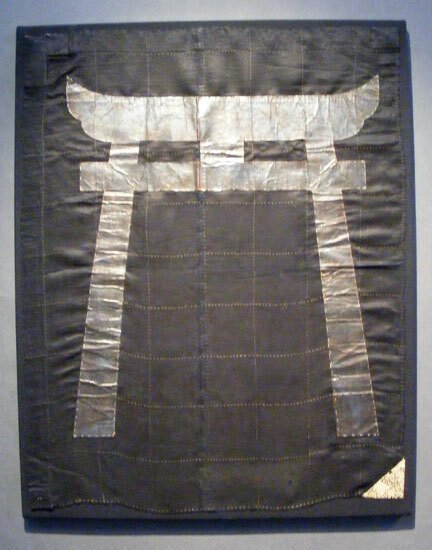 Paper-thin sheets of silver (I am not certain of the material) in the shape of a Torii are stitched onto what was once solid black silk. This would have been an impressive sight when displayed in sunlight. beautiful piece. great write up, thanks….